404mm Rosewood Replacement Fascia Board - 1m length. (This product is avaliable in Golden Oak, Black Ash and plain White. Please see our other fascia sections for these colours). 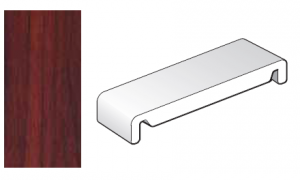 These plastic fascia boards are 18mm thick with 2 x 35mm return legs. All sizes are External measurements. These plastic boards are mainly used for the Box End sections where the pitched fascias on the gable end join the horizontal fascias. Please see Floplasts Box End section details.